“What’s cooler for you, the multiple gold medals or a movie about your life?” Emotional Mojo asked Gabby Douglas in an interview about her upcoming movie, “The Gabby Douglas Story.” The movie based on Gabby’s Olympic journey, comes out this Saturday at 8/7c on Lifetime. “Beyond the Headlines: The Gabby Douglas Story” will follow at 10/9c. Gabby talks about different aspects of her journey with Emotional Mojo as they look at different scenes from the movie. She says that one thing she loves about the movie is that is shows her family’s struggles. She hopes that those inspire people. To hear what’s cooler, watch the end of the interview. Arsenio Hall sat down with Gabby and the two girls who play her in the film. I was very impressed with the two actresses – Imani Hakim and Sydney Mikayla. Sydney is a precocious, bubbly ten year old who embodies all of the things we loved about Gabby and reminds me so much of interviews with Gabby in the years before the Olympics. Imani talks about how her journey to become an actress has some similarities to Gabby’s story with great poise. They both embody who Gabby is and make me want to see the movie! Gabby talked with USA Gymnastics about the movie (read the interview here). She also talked about how fun it was to see billboards on both sides of the country. McKayla Maroney seems to think so to. There are a number of fun interviews with Gabby surrounding the movie, which tell more about her journey. Here are some of my favorites. Gabby and Natalie Hawkins talk about their thoughts and differing perspectives on competition. Gabby and Natalie talk about confidence and finding that confidence and the hard work in her journey. And finally, here is the preview. Don’t forget to watch it tomorrow or set your DVRs! Today the Fierce Five were inducted into the USA Gymnastics Hall of Fame. Though we don’t have any official press releases or coverage yet, here is a twitter round-up of the event. Standing in The Hall Of Fame!!!! Can’t believe we are in the Hall of Fame!! Such an amazing honor to share with my team mates. love them to death. And here are a few tidbits about the futures of some of the Fierce Five. Jordyn Wieber similar but plans on starting UCLA in the fall. Will train out there, see how it goes then maybe _ maybe _ head back to MI. Aly says she’s going to get back into training soon. Not sure when. Had only brief chats with Mihai about plan. Gabby says she’s still w/Chow. Says they’re working on skills. Pointed to next year’s nationals as her return if everything goes well. 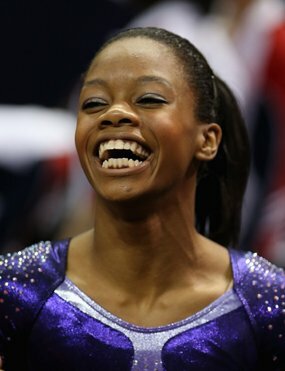 Gabby Douglas has been known as the Flying Squirrel for her high flying antics on the bars. Undoubtedly the best bar worker the USA currently has in their arsenal, Gabby began to make her bid as a true All Around threat at the US National Championships back in June. She had shown a flash of brilliance earlier in the season in the American Cup but had not maintained that brilliance through the rest of the spring. It was in St. Louis that she challenged Jordyn Wieber for the National Title and almost won. Her next foray came at the Olympic Trials where she earned the only automatic spot of the USA team by scoring the highest All-Around total over two days. Even so, Gabby had never put together four hit routines in one night. As we pondered the All Around gold possibilities, Blythe from The Gym Examiner said, “You only have to put it all together once. It just has to be on the right night.” That Gabby had the talent was never a question. But could she hold up under the intensity of the Olympic spotlight? Could she put it all together that one time, the night of the All Around finals? In qualifications, it seemed that she would do it. She held it together, performing incredibly on vault, bars and beam. When it came to floor however, her old nerves crept in. Gabby had a major mistake on her second pass and literally bounded out of bounds. Doubt may have crept back in to others minds, but not into hers. Gabby came out into team finals and gave the performance of her life. She cleanly hit every routine with nary a bobble. Her All-Around score was easily the highest that had yet been put up in the games. She did it! Four incredible hit routines in one night! She had put it all together! Was it possible that she could do it back to back? Watching her cool, collected demeanor would say that it was. And as it turned out, Gabby put it all together twice. On the two nights of nights. Gabby led from start to finish. Opening up with one of the best vaults she has done, she emphatically said that she meant business. She continued on throughout the night, hitting her high flying beam routine, sailing through her complex beam routine and tumbling her way to Olympic gold. It was a beautiful, incredible, performance. Scoring the highest All-Around score of the entire quad (four years between Olympics) Gabby truly won gold. 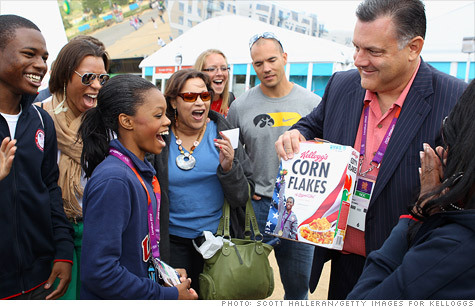 But it is not only the gold medal around her neck that earns her the newly donned Golden Gabby nickname. It is her golden personality. Gabby’s smile is impossible to resist. She has that bounce in her step, that spark in her eye that hint at her bubbly, positive personality. The only thing that comes more quickly than her brilliant smile is her infectious laugh. Gabby has stolen our hearts with more than her dazzling performance. Her true grasp of the honor it is to represent her country oozes through every word. The responsibility and maturity she feels as a role model to the gymnasts – especially the African American gymnasts – she has inspired is beyond her years. And her playful personality warms our hearts. She will be a beloved gymnast for years to come. The all-around gold medal is the most coveted individual gymnastics achievement. When people refer to the champion, they mean the all-around champion. This Olympic year has an EXCITING all-around competition in store! Most years in women’s gymnastics there is a battle between two, maybe three gymnasts for the gold medal. This year, that is not the case. This all-around final will have five gymnasts who could win the gold medal. There are twenty- four gymnasts in all who qualified into the All-Around finals. Here are the top five who will be vying for the podium. Who will end up on top is anyone’s guess. Hold onto your hats ladies and gentlemen, this is going to be a wild ride! After losing the gold to Jordyn Wieber last year by the smallest of margins, Viktoria comes into these Olympics ready to do battle – and win. Her slight form hides the incredible power underneath. She dances like a ballerina, vaults with power and grace, swings bars like she was meant to live life in the trees and tumbles on the beam as if she was light as a feather. Viktoria debuted her amanar for the first time in her senior career during qualifications. Adding that to her arsenal along with one of the most difficult, perfectly executed bar routines in the world right now gave her the edge she needed to qualify in first. Her beam and floor routines are both exquisite, but not very consistent. She tends to either hit or miss on beam and is often plagued with low landings on floor. She will have to bring her best to keep her place at the top of the podium. Aly is known to be one of the most calm, consistent competitors there is. Long overshadowed by higher scoring teammates, Aly shocked the world and herself by qualifying in as the top American. She comes in with the highest difficulty and most consistency on vault, beam and floor. However, her lower difficulty on bars, along with her poor form on this even is what keeps her from the top of the podium. She was fourth at last years world championships with a horrible mistake on bars. Aly did the best vault of her career in qualifications, cleaning up her form issues and landing with just a small hop. She did the best bars routine she has ever done by far during podium training, seemingly to finally overcome her form breaks. She is generally rock solid on beam, and has scored the highest floor scores in both the team and qualifications. Overall, Aly does not have high enough difficulty to win gold without mistakes from both Gabby and Viktoria. But her rock solid, consistent performances make her a gymnast you should not count out. After all, as we have seen, anything can happen in the pressure of the Olympic spotlight. Gabrielle, or Gabby, has been a rising star this year. Last year, she was known for her high flying bar routine, but her mental game was just not strong enough for her to be an all-around threat. This all changed when she came roaring out of the gate as an exhibitionist at the AT&T American cup. She unofficially (her scores did not count as an alternate) ran away with the gold. Since then, Gabby has been inching away at Jordyn Wieber’s lead in every meet until she finally overtook her by .1 at the Olympic Trials. Gabby comes in with one of the highest potential start values of the group. She has the physical ability to blow away the competition. What remains to be seen is if she can continue improving her mental game and hit the routines when they count. She qualified in third because of a large error on floor. However, she hit four for four during team finals, and her All-Around score there would have easily won the title. If everyone brings out their best and they all hit, Gabby most likely wins. She will have to keep control of her nerves to stand on top of the podium. In 2010, Aliya was a star. In fact, it seemed she was on her way to becoming one of the gymnastics greats. Had we ever seen someone who could vault with the power and amplitude she attained and dance like a prima ballerina on floor? Someone who’s beautiful swing on bars was only outdone by her lightness and sureness on beam. Aliya won the all-around. She led the Russian team to gold. She qualified in EVERY event finals and placed on the podium in all but beam, where she had her only mistake of the entire competition. She looked unstoppable. Unfortunately, an injury has put a serious roadblock in her path to glory. In 2011, she tore her ACL at the European Championships while performing her famous amanar. Her recovery has been difficult. She has grown and is still not used to her new body. But she has continued to train hard. Aliya has yet to show the level of gymnastics and performance she attained in 2010 this year. She is not competing with the level of difficulty she formerly attained. But Aliya has a competitive drive, a fierceness and focus on the competition floor like few others. She has that undefinable quality and mental drive that propels her to the front. Her team loss will only drive her more. I would not be surprised at all if she ends up on the podium. Larisa’s junior showings made her highly anticipated as the Romanian all-around contender at the Olympics. She has a charming floor routine, one of the most difficult beam routines being performed at the Olympics, a solid vault and a very decent bar routine. Her achilles heel at these Olympics has in fact been her heel. She has plantar faciitis in her left heel and has not been able to put in a great deal of training over the past week. This has definitely shown in bother her qualification and team performances. She has not been on her game. Hopefully the additional days of rest and training will allow her to continue on the trajectory she has been on her entire career – a place on the Olympic All-Around podium. In addition, Deng Linlin from China qualified into the top group. This group will all compete together, starting on vault. It should be noted that Larissa did not qualify in this group and will start on bars. Once again, we all want these women to go out and have incredible, hit competitions! This American generation is incredibly strong and the five member team is made up of young gymnasts. However, they all have a lot of international experience and four of the five were part of last years World Championship team. This team of rookies took Worlds by storm. Even with the last minute loss of their team leader, they had one of the most dominate performances in a long time, hitting every single routine in prelims and in team finals. All but one of the 2008 team made a run for this Olympics, but with the strength and depth of these young gymnasts, were not able to make the team. Follow the link for a more in depth write up on each gymnast. Jordyn Wieber: Jordyn is in her second season as a senior and is the current World Champion. She competes some of the most difficult skills in the world with dynamic precision and impeccable form. Her weakest event is bars, if you can call an event where you make world finals weak. Jordyn is mentally tough and focused. Her biggest challenge this year will be the pressure of being the one everyone is trying to beat. She will compete all-around in Prelims and Team Finals and will be looking to win the all-around gold. She might make a few event finals as well. Gabrielle Douglas: Gabby is also in her second year as a senior. She is phenomenal on bars. She SWINGS bars with incredible fluidity, beautiful lines and high flying tricks. Gabby was a bit unpredictable on the other events last year, but really came into her own this year, upgrading on every event, and competing with a new confidence and poise. She capped off the season by winning the Olympic Trials. Gabby will compete all-around in Prelims and will be looking to win the all around gold. She will definitely be competing bars in the Team Finals, and the other events will most likely be decided depending on how Prelims go. Alexandra Raisman: Aly is in her third season as a senior and is our USA rock. She is so steady and comes through with performances that look just like she practices. She is phenomenal on floor and great on vault and beam. Bars is her nemesis and keeps her from fighting for the gold. Aly continues to improve her form and has some major upgrades on floor- doing some of the most difficult tumbling in the world. She will do all around in the prelims and will most likely be used on beam and floor in Team Finals and possibly vault. Aly will also be looking to challenge for a gold on floor. McKayla Maroney: McKayla is another second year senior and is the current World Vault Champion. She does the infamous amanar with such ease, grace and an explosion of power, it is in a class of its own. She also has a beautiful, artistic floor routine with lots of difficulty. However, her landings have been fairly inconsistent. She is on the team for one reason, vault. She will compete vault and floor in Prelims and will be looking to win the vault gold. She will compete vault in Team Finals and floor will most likely depend on how Prelims goes. Kyla Ross: Kyla comes into her senior year as the Jr. National Champion. She was a top all arounder and particularly shines on bars and beam. She is also great on vault. Though Kyla can hold her own in the all-around and on vault in most places, she comes in fourth in the all around and fifth on vault on this team. She will be competing bars and beam in the Prelims and undoubtedly in the Team Finals. She will be hoping to qualify for event finals on those two events as well.